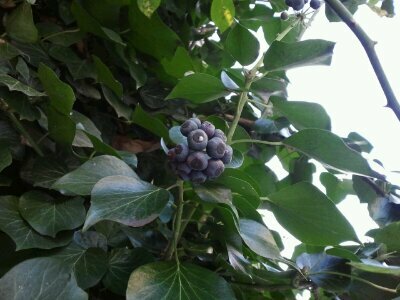 Today some Ivy berries (Hedera helix). I don’t think they are edible – I don’t fancy trying them even if they are but the plant in general is sometimes useful externally an agent to help rid the body of cellulite. The pom-pom flowers come late in the year and are a useful source of pollen for insects and now come the striking purple-black berries. Not sure about the berries but I know that the leaves taste amazing to the wallabies because they have eaten Steves peace sign topiary back to stems every single year since we got here!